Summary: Guess Which Guest is about who did what during the past year. 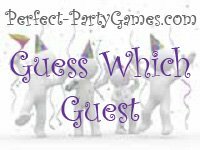 Prior to the evening, find out something about each of your invited guests that happened to them during the past year. Write all the statements on a single piece of paper. Copy as many as you need, one for each player. The statements could be something like "________ lived in another state most of this year." Or maybe "_________ went on vacation to Africa this year." Everybody gets a game sheet. They must fill the in the blanks with the name of the guest whom they believe had that experience this year. Give the players only 5 to 10 minutes to complete the game. The player with the most correct answers, wins.